Difference between revisions of "MOD-HOST & MOD-UI"
* MDA JX10, a Roland JX10 emulator with a lot of mind-boggling presets. * TAL Noize Mak3r, a true ears-breaker with really fat sounds. MOD-HOST & MOD-UI are written and maintained by http://www.moddevices.com. They sell a very nice effect pedal device called Mod Duo for about €549.00. Mod Duo is configurable to use multiple LV2-plugins via a built-in webpage accessible by a USB or Ethernet connection to the device. MOD-UI is the code for the webpage. It's open-source, too, so Zynthian uses it as one of the synth engines. 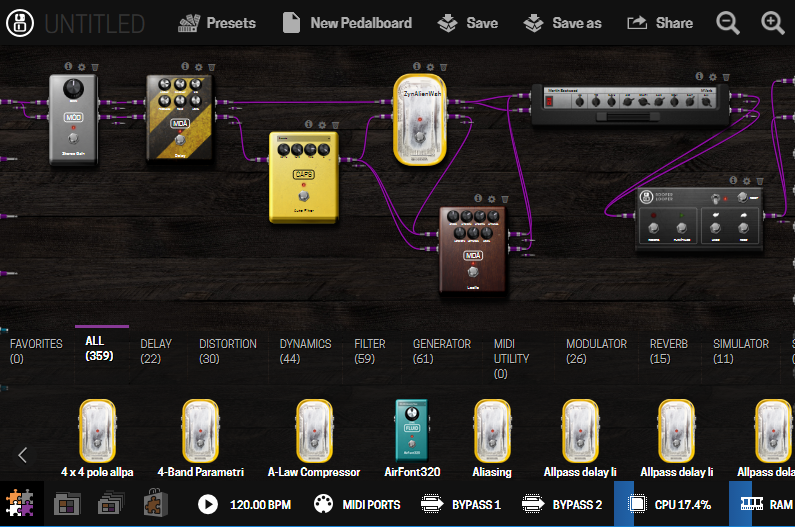 In MOD-UI you can drag & drop icons representing LV2-plugins of several types (modulators, equalizer, generators (=> synths), distortions, voice effects, vocoders, ...) and connect them together in a way which is really intuitive and easy. MOD-HOST is the engine that runs the LV2 plugins. Dexed, an amazing Yamaha DX7 emulator that can import DX7 SysEx files. Thanks to Holger Wirtz by creating this native port to LV2. MDA EPiano, sounds like a true Fender Rhodes. MDA JX10, a Roland JX10 emulator with a lot of mind-boggling presets. TAL Noize Mak3r, a true ears-breaker with really fat sounds. This page was last modified on 30 January 2019, at 03:37.